The weather is still frigid in Canada but the 8th Annual Chili Cook Off for Community Care in St. Catharines, Ontario is here, and it's a beginning for Cook Offs all around North America. Chili itself is somewhat of a mystery in its draw of public attention. Chefs from around the world compete in various events, television has made such competitions a nightly attraction to their viewing lists. A Chili Cook Off does not have any such requirements as professional accreditation, or for that matter a tall pleated white hat. So what is the allure of chili, other than its rich aroma? Originally its proper name was Chili con carne, taken from the Spanish. The word chili means the chili pepper, and carne means meat. In America the Spanish chili con carne found itself shortened to just chili, still with the chili pepper and meat being left in place. The basic recipe for a chili is simple chili peppers, meat (most often beef) tomatoes, and beans, with other seasonings such as garlic, onions and cumin. True there are champions of the cook off rounds that claim to have secret ingredients which make their chili the most wanted, but as they are a secret I can't really give any away. Origins of chili can be identified to the Spanish, yet its successful crossing into North American culture is more conjecture. American frontier settlers had their own recipe which was pounded together to form bricks, then dried so it could be boiled in pots on the trail. This was a simple combination of dried beef, suet, dried chili peppers and salt, would it win the championships held annually in Palm Springs, California? Chili apparently crossed the border into San Antonio, Texas and then made its way across the South and West of the United States. At the 1893 Columbian Exposition in Chicago, the San Antonio Chili Stand became the ambassador of a taste revolution that surpassed the Alamo. In San Antonio during the 1880s Mexican-American women known as the “chili queens” operated makeshift stands selling precooked chili, alongside mariachi street musicians, in the Mercado District. Sadly or not came strict health department sanitary regulations and the chili queens disappeared. In the 1970s the Mercado was renovated to become the largest Mexican marketplace in the US and the return of the chili queens became an annual festival. The historic Bonham Exchange Building behind the Alamo has hosted the official Chili Queens event annually since 2006, and it is held in April each year. So although the Alamo holds a special place in Texas history where bravery and valour stood against the might of numbers, the Chili Queen event at times calls upon bravery to stand in the face of smaller numbers of spicy ingredients. As a whole, chili spread across the US with chili parlours opening around the country, each claiming to have its own secret ingredient. One of the more famous of these chili parlours was located in Dallas across the road from the Neiman Marcus department store, where the president of the store frequented. Not only did Stanley Marcus visit Bob Pool's 'joint' he shipped by air express Pool's Chili to friends and customers across the country. So now we are facing a chili cook off here in my hometown. It may not be as famous as the world championships of chili held in Palm Springs, California annually, but still it's in its 8th presentation and the competition is as impressive. Arguments may continue to rage in relation to whether beans belong in a chili, or whether Lyndon B. Johnson's favourite chili recipe known as Pedernales River Chili is the best. (After all the White House printed and sent out recipe cards in the thousands for the Pedernales River Chili). Heck even tomatoes find themselves at question, and not whether they are a fruit or a vegetable. 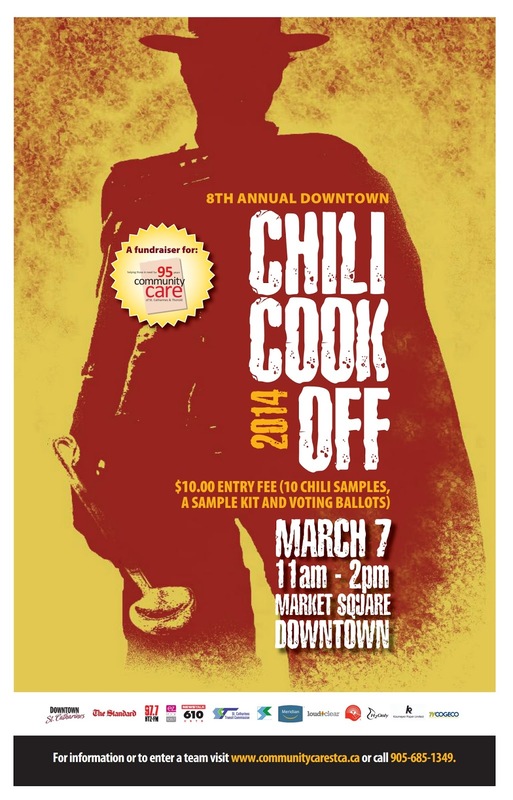 On March 7th 2014, fifteen contestants will bring forth their chili to be judged and tasted. This event is not behind the Alamo, though it is behind the City of St. Catharines City Hall offices, take that as you wish. This event is sponsored by Community Care, an organisation that does so much for people in need, and believe me there are too many people who face hardship and turn to this wonderful group of caring people. That alone is enough to support this event, but since chili is the main ingredient, and chefs and cooks gather, then that's a whole different game added. Without a doubt there will be several out of the group of contestants, who will claim they have the secret. I'll be one of the contestants, as a chef I have my team alongside of me, though I lay claim to no secret. I have served my chili at my chef's station at Sobeys – Scott and Niagara Street with pride giving out more than 400 copies of the recipe to customers, and as far as secrets go... well maybe there is one or two. Good luck to all chili cooks around the globe wherever they are. On March 7th the games begin and the taste buds will definitely vote for their favourite. Oh and my full recipe will be published after the 7th.